Converting waste biomass into value-added biochar has been considered as a green and sustainable strategy for resource management and pollution control. In this study, graphitic carbon nitride (g-C3N4) modified biochars (BCs) were produced through one-pot pyrolysis of urea and hickory chips in differential ratios at 520 °C. The resulting BC/g-C3N4 composites were evaluated in laboratory for their physicochemical, adsorptive, and photocatalytic properties. The characterization tests showed the successful synthesis of the BC/g-C3N4 composites that introduced g-C3N4 structure, N-containing surface functional groups, reduced surface area, and better thermal stability to the biochar. After modification, the BC/g-C3N4 composites showed better adsorption ability to reactive red 120 (RR120) than the pristine BC, due to the strong electrostatic attrition between N-containing functional groups of g-C3N4 on biochar surface and anionic RR120. The BC/g-C3N4 composites also inherited g-C3N4’s photocatalytic activity, which is visible light responsive to generate free radicals for RR120 degradation. In addition, the composites with higher urea modification ratios were more effective in the degradation of RR120. 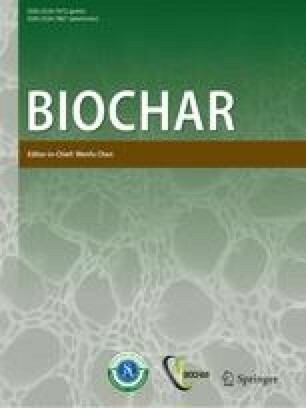 Overall, this study demonstrates the feasibility and promising potential of combining biochar and photocatalyst for the removal of aqueous dye. Because of the synergistic adsorption and photodegradation ability, BC/g-C3N4 composites present a novel and cost-effective solution for the removal of aqueous dye and other photodegradable contaminants under natural conditions. The online version of this article ( https://doi.org/10.1007/s42773-019-00007-4) contains supplementary material, which is available to authorized users. Wastewater effluents discharged from textile, leather, paper, and pharmaceutical industries, containing high level of organic dyes often found in surface and underground water, as well as in soils, can trigger serious environmental problems due to their adverse effects (Lyu et al. 2018; Wang et al. 2018b). Approximately 10–15% of the dye is lost in the industrial effluent during the dyeing process and released into the environment (Senthilkumaar et al. 2006). Among these released dyes, azo dyes constitute the largest and the most important category (Neamtu et al. 2002). Reactive red-120 (RR120), a typical reactive azo anionic dye, is potentially carcinogenic, mutagenic, and allergenic on exposed organisms because of its metabolites (e.g., aromatic amines) (Senthilkumaar et al. 2006). RR120 is more stable and has lower biodegradability in aqueous solutions than other types of dyes (Padmanaban et al. 2016). Therefore, it is important to develop low-cost and sustainable methods to remove RR120 from the effluent before being discharged into the environment. Various treatment processes have been investigated over the past to reduce the dye levels in industrial wastewaters, such as chemical precipitation, ozonation, membrane filtration, oxidation, photodegradation, adsorption, etc. (Castro et al. 2017; Liu et al. 2017; Vaiano et al. 2015). Among all the treatment technologies, adsorption has been shown to be a promising way to treat textile dye effluents. US Environmental Protection Agency (US-EPA) has also acknowledged adsorption process as one of the most desired control methods (Fayazi et al. 2015). Conventional adsorbents such as activated carbon, biochar, hydrogel, fly ash, metal–organic frameworks, graphene oxide, magnetic nanoparticles, and their composites are often used in dye removal and show high adsorption efficiency (Ding et al. 2016; Petit et al. 2011; Wang et al. 2018d; Zhou et al. 2014). Among these adsorbents, biochar, a pyrogenic carbon material produced through thermal or hydrothermal conversion of biomass, has attracted much attention. Biochar is a stable solid, rich in carbon, porous with large surface area, low cost, and environmentally friendly, and thus is widely recognized as a low-cost adsorbent for removing various containments including heavy metals, organic compounds, and nutrients (Ahmad et al. 2014; Cao et al. 2009; Yang et al. 2017; Zhang et al. 2017). It can be further engineered for improved physiochemical and sorptive properties by various physical, chemical, and biological modification methods (Wang et al. 2018a, c). Most exhausted adsorbents including post-adsorption biochar may require stringent conditions to be properly disposed or regenerated, which increase the processing cost and the potential risks of secondary risks (Jiang et al. 2018; Wan et al. 2017; Wang et al. 2015). In recent years, the concept of sustainability and environmental friendliness has stimulated research interests on self-regenerating adsorbents with both adsorptive ability and photocatalytic activity. If it is self-regenerable, biochar can be used as an unlimited adsorbent because the adsorbed contaminant may be photocatalytically degraded under light irradiation. This provides fast regeneration of the biochar adsorbent and thus a promising novel solution for the removal of harmful contaminants (Panneri et al. 2017). In previous studies, biochar has been modified with various photocatalysts such as Fe3O4, BiVO4, FeVO4, BiOCl and ZnO to remove contaminants through both adsorption and photocatalytic degradation (Jeon et al. 2017; Kumar et al. 2018; Li et al. 2019; Xie et al. 2019). The preparations and synthesis of these photocatalyst-modified biochars (i.e., biochar–photocatalyst composites), however, often require multiple steps or expensive chemicals, limiting their large-scale productions and applications. Among the photocatalysts with visible-light response, graphitic carbon nitride (g-C3N4) is especially attractive because of its low cost, high efficiency, and excellent chemical stability (Han et al. 2016). Furthermore, g-C3N4 can be obtained directly from inexpensive feedstocks such as urea through pyrolysis (Han et al. 2016), making it possible to produce biochar-photocatalyst composites through facile ‘one-pot’ process. The main objective of this study is to develop a facile and cost-effective synthesis of biochar-based composite material with both adsorptive ability and photocatalytic activity. Novel graphitic carbon nitride (g-C3N4)-modified biochars were produced through one-pot pyrolysis of urea and biomass of different ratios. The physicochemical properties of the biochar/g-C3N4 (BC/g-C3N4) composites were characterized. In addition, the adsorptive and photocatalytic removal of RR120 by the composites were also evaluated. All chemicals used in this work are in analytical grade and were used as received. Deionized (DI) water (18.2 MΩ, Nanopure, Barnstead) was used to prepare all chemical solutions. RR120 (C44H24Cl2N14O20S6Na6, MW = 1469.98 g/mol) was purchased from Sigma-Aldrich. Urea (CH4N2O, MW = 60.6 g/mol, ACS certified) purchased from Fisher Scientific was ground into powder and dried in an oven at 80 °C for 12 h before use. Hickory wood chips obtained from Cowboy Charcoal, LLC, were washed, air-dried, and ground into powders of 0.5–1 mm as the feedstock biomass. The urea and biomass were mixed at different M:M ratios (25:1, 50:1 and 100:1). The mixtures were transferred into aluminum oxide crucibles and capped with matched lids. The samples were then pyrolyzed in a muffle furnace (Thermo Scientific, USA) at a heating rate of 5 °C/min and held at a peak temperature of 520 °C for 2 h in an air-limited environment. After cooling down to room temperature, the samples were rinsed with DI water to remove impurities. Finally, the samples were oven dried at 80 °C and stored in a sealed container for future use. Pristine biochar (BC) was produced from Hickory wood powders without any urea under the same conditions. The resultant samples were labeled as BC, BC25, BC50 and BC100 to reflect the urea additions in the feedstock. X-ray diffraction (XRD) analysis was applied to identify the crystallographic structure in the samples using a computer-controlled X-ray diffractometer (Philips Electronic Instruments) equipped with a stepping motor and graphite crystal monochromator at a scanning rate of 0.02°/s for a 2θ range of 10o–60o. The microscopic structures of the BC/g-C3N4 composites were characterized by a field emission gun scanning electron microscopy (FEG-SEM, JEOL 6335F). Brunauer–Emmett–Teller (BET) specific surface areas (SAs) of the samples were determined based on the N2 adsorption–desorption method using a Quantachrome Autosorb-1 analyzer (Quantachrome Instruments, Florida, USA). The samples were de-gassed under vacuum for at least 24 h at 180  °C prior to analysis. Specific surface area was calculated according to the BET theory using adsorption data in the 0.01–0.3 relative pressure range. Pore volumes were calculated using the Barrett–Joyner–Halenda (BJH) theory. Pore size distributions were calculated from adsorption branch isotherms using the BJH method assuming right cylindrical pores closed on one end and using the Halsey layer thickness equation. The surface functional groups were detected by FTIR spectroscopy (IR Prestige 21 FTIR, Shimadzu, Japan). Thermal stability analysis was performed in 25 mL/min air stream at 5 °C/min from 25 °C to 1000 °C utilizing a thermogravimetric analyzer (TGA/DSC1, Mettler Toledo, USA). X-ray photoelectron spectroscopy (XPS) measurements were carried out with a PHI 5100 series ESCA spectrometer (PerkinElmer) to determine the elemental composition on sample surfaces. Adsorption kinetics of RR120 onto the BC and BC/g-C3N4 composites were determined by adding 0.1 g of samples into 100 mL of 20 mg/L RR120 solution followed by sonication. The well-dispersed solution was maintained at 25 °C in a continuous stirring reactor in a dark environment. The solution was periodically sampled until adsorption equilibrium and RR120 concentrations were measured with a UV–Vis spectrophotometer (Thermo Scientific, USA) at 515 nm. The adsorption and photocatalytic degradation of RR120 were undertaken in a light photochemical reactor with a 36 W LED lamp with wavelength in the range of 395–400 nm. 0.1 g of the samples were added into 100 mL (1 g/L) of 20 mg/L RR120 solutions and were mechanically stirred at 25 °C in the dark for 24 h to ensure that all the samples could reach adsorption equilibrium. Afterwards, the LED light was turned on for irradiation. The solutions maintained at 25 °C was also continuously stirred and periodically sampled for determination of RR120 concentration with the method mentioned above. Figure 1a presents the XRD spectra of the BC/g-C3N4 samples prepared at different urea/biomass ratios. BC from the biomass and pristine g-C3N4 derived from urea alone were also produced under the same conditions. Their XRD spectra are also provided as references. The bulk g-C3N4 sample reveled two obvious peaks at 27.4° indexed as (002) planes and 13.1° indexed as (100) (Fig. 1a), corresponding to carbon nitride (Ong et al. 2016). The BC sample showed the general pattern of amorphous carbon without any characteristic peaks in the XRD analysis. For the BC/g-C3N4 composites, the main peaks of BC25, BC50, and BC100 were all around 27.4°. The intensities of the peaks increased with the feedstock/urea ratios at both 13.1° and 27.4°, which indicates that higher urea content can generate more g-C3N4 in the composites. Figure 1b presents the comparison of FTIR spectra of the BC and BC/g-C3N4 composites. For BC, the obvious band peak at 860, 1405, 1585, and 3400 cm−1 can be attributed to typical biochar functional groups CO32−, –C–H2, C=C/C=O aromatic, and hydroxyl group (–OH), respectively (Yuan et al. 2011). For the composite samples, typical stretching modes of CN heterocycles were displayed at 1251, 1325, 1419, 1571, and 1639 cm−1 (Han et al. 2016). In addition, the wide peaks between 3000 and 3500 cm−1 (N–H) and characteristic intense breathing mode of triazine units at 805 cm−1 were also observed (Tang et al. 2017). These findings are consistent with the results reported previously (Pi et al. 2015), which indicate the formation of g-C3N4 and N-containing function groups on the biochar composite surface. Moreover, BC100 samples had the most g-C3N4 on the surface of the samples because the g-C3N4 characteristic peaks achieved more intense singles in the composite with higher content of urea modification. The TGA showed that all the samples had negligible weight loss below 200 °C (Fig. 1c). BC decomposition process started around 400 °C and finished at 500 °C with residual ash content of around 5%. The decomposition of the BC25, BC50 and BC100 was obviously postponed, which started around 500 °C and finished at 634 °C, 645 °C, and 680 °C, respectively, with less than 1% of residuals (Fig. 1c). In addition, the decomposition temperature of the composites increased with the increasing urea ratio. These results suggest that g-C3N4 modification can improve the thermal stability of the biochar. The morphology and microstructure of the biochar/g-C3N4 composites were investigated by the SEM. Aggregated g-C3N4 structure was observed on the surface of porous biochar for BC50 (Fig. 1d), confirming the formation of BC/g-C3N4 composites. The SEM images of BC25 and BC100 can be found in Fig. S1 and S2 (Supporting information). XPS was employed to investigate the chemical composition and surface characteristics of the BC/g-C3N4 composites. XPS survey scan of C and N elements and the C:N ratios among the samples are shown in Fig. 2a. There was no obvious binding energy shift of C1s, N1s and O1s in the survey scan. With the increasing addition of urea, the N content on the sample surface increased but C:N ratio decreased correspondingly. This finding is consistent with the FTIR results showing that the increase of N content increased intensity of the g-C3N4 characteristic peaks. The high-resolution C1 s spectra (Fig. 2b) of BC were deconvoluted into three peaks centered at 284.5, 286.0, 288.6 eV after Gaussian curve fitting, which can be ascribed to the typical sp2 C=C, C–O and C=O bonds, respectively. In BC25, BC50, and BC100 samples, the high-resolution C1 s spectra (Fig. 2c) slightly shifted, which were separated into three peaks centered at 284.8, 286.4 and 288.3 eV. These peaks can be assigned as graphitic sp2 C–C or the cyano-group, surface amino functional group (C–NH2) or C–O binding, and N–C=N coordination in the graphitic carbon nitride lattice, respectively (Panneri et al. 2017). The high-resolution N1s spectra (Fig. 2d) presented an asymmetrical peak shape, indicating co-existing nitrogen binding environments. The two peaks at 398.7 and 400.2 eV can be assigned to typical N atoms sp2-hybridized with two carbon atoms (C–N=C) and tertiary nitrogen N-(C)3 (Ge and Han 2012). For both C and N spectra, the deconvoluted peaks and distribution for all the composite samples are summarized in Table 1. With increasing urea modification ratio, the high-resolution C1s showed the transformation from amorphous carbon to g-C3N4 lattice; the N 1 s spectra showed increased relative intensity at peak 398.7 eV (51.93–61.10%) while decreased peak at 400.2 (48.07–46.88%). These results indicate that the g-C3N4 contents in the composites increase with the urea modification ratio and further confirm the formation of BC/g-C3N4 composites. The BET surface areas of the BC, BC25, BC50, and BC100 were 269.9, 33.7, 49.1, and 53.5 m2/g, respectively. After modification, the surface area of the biochar decreased significantly, suggesting that part of the pores of the biochar may be clogged by the g-C3N4 aggregation. This result is consistent with the SEM result and findings in the literature that g-C3N4 can form aggregates on the surface or within the pores of biochar to reduce specific surface area (Kumar et al. 2017). Figure 3 presents the adsorption kinetics of RR120 onto the biochar samples with initial RR120 concentration of 20 mg/L. BC samples showed very low adsorption ability to RR120 and reached to equilibrium in less than 1 h. After modification, the BC/g-C3N4 composites clearly displayed enhanced adsorption performance with adsorption capacities approximately six times higher than those of both BC and pure g-C3N4 (Fig. S3, supporting information). All the composite samples achieved relatively similar RR120 removal rate in the range of 70–80%. Various models were employed to simulate the adsorption kinetics of RR120 onto the BC/g-C3N4 composites. The best-fit model parameters are listed in Table 2. Pseudo first-order kinetic model reproduced the BC kinetic data well with R2= 0.88, indicating that the adsorption of RR120 by pristine biochar could be controlled by the physical surface adsorption mechanism (Gerente et al. 2007). Although g-C3N4 modification dramatically reduced the surface area of biochar, the BC/g-C3N4 composites showed improved adsorption of RR120, indicating that the adsorption may not be dominated by the physical surface adsorption mechanism. Furthermore, pseudo second-order model simulated the kinetic data of both BC50 and BC100 the best (R2> 0.98) and Elovich model best described the BC25 adsorption kinetic data (R2= 0.99). These results suggest that the adsorption of RR120 on the BC/g-C3N4 composites could be controlled by multiple mechanisms (Gerente et al. 2007). When the urea modification content increased, the adsorption kinetics of RR120 on the composites became faster, indicating the importance of g-C3N4 and N-containing functional groups on the biochar surface to the adsorption process. 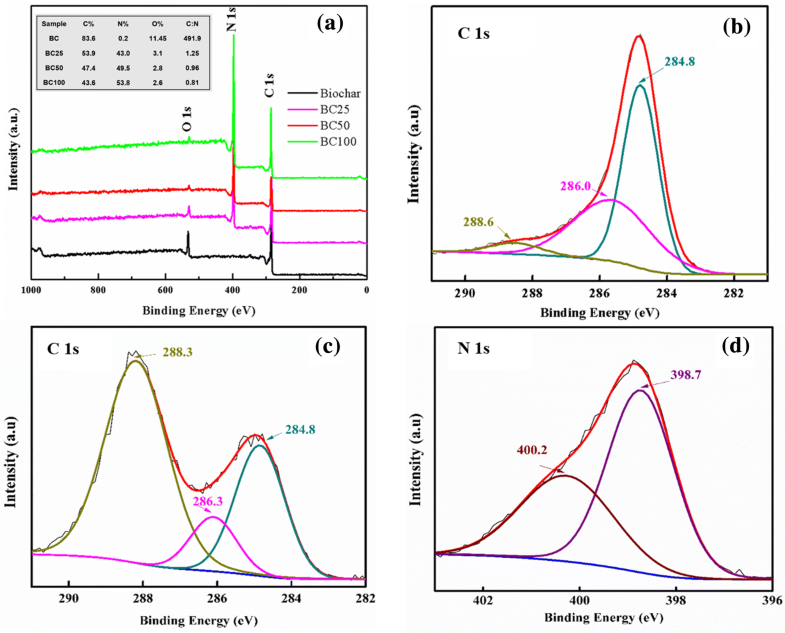 The presence of g-C3N4 and N-containing functional groups may promote the adsorption of anionic RR120 onto the BC/g-C3N4 composites through electrostatic attraction (Beyki et al. 2016). 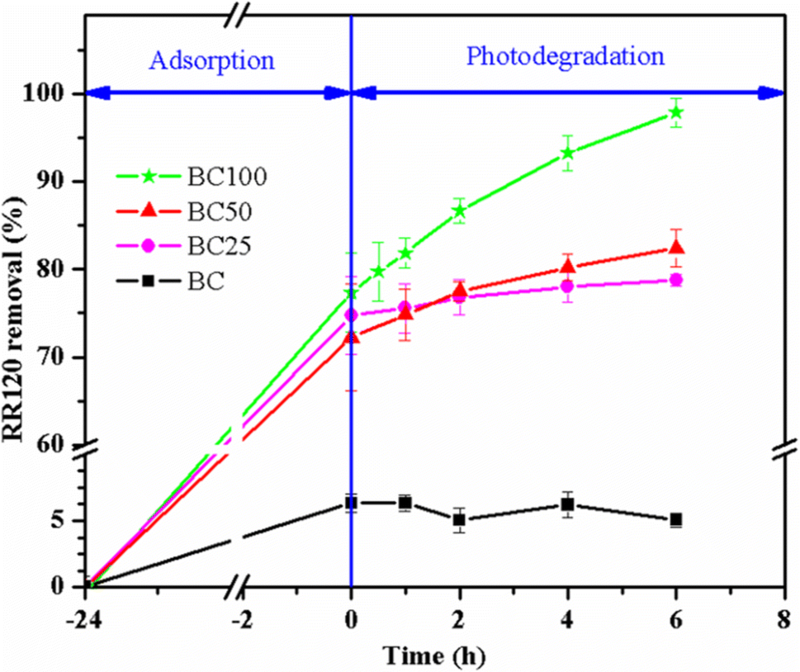 RR120 photodegradation experiment was performed after all the BC and BC/g-C3N4 composites achieved their adsorption equilibria. The order of sorptive removal was BC100 > BC25 > BC50 > BC (Fig. 4). 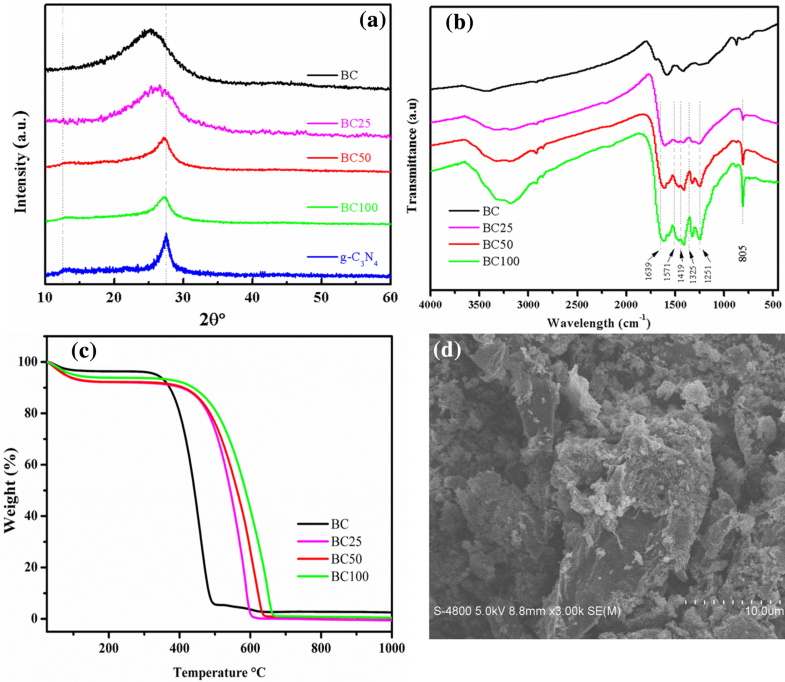 The photodegradation was then initiated with light irradiation for 6 h. While the BC sample did not display any noticeable signs of RR120 degradation, all the composite samples showed photocatalytic activities to degrade RR120 under the LED light (Fig. 4). With a narrow band gap, the g-C3N4 supported by the biochar can utilize visible light to facilitate the generation of free radicals such as hydroxyl radical in aqueous solutions to degradation dyes including RR120 (Ong et al. 2016; Rhodes 2017). In this work, BC100 was the most effective photocatalyst and showed complete dye removal (100%). During the initial 2 h of irradiation, the RR120 degradation rates of all the composite samples were linear. After that, the photocatalytic degradation rates gradually slowed down with decreasing slopes. These results demonstrate that the g-C3N4 modification grants the biochar photocatalytic activity. However, all the BC/g-C3N4 composites presented lower degradation of RR120 than pure g-C3N4 (Fig. S4, supporting information), probably because dark-colored biochar may absorb part of the light to reduce the production of free radicals for RR120 degradation. Because g-C3N4 is visible-light responsive (Ong et al. 2016), the BC/g-C3N4 composites can remove dye and other degradable contaminants through both adsorption and photocatalytic degradation under natural conditions. The photocatalysis degradation ability of the BC/g-C3N4 composites may also make the adsorbents self-regenerable by degrading contaminants on the adsorption sites. All these make BC/g-C3N4 composites the composites a promising biochar-based material for various environmental applications. 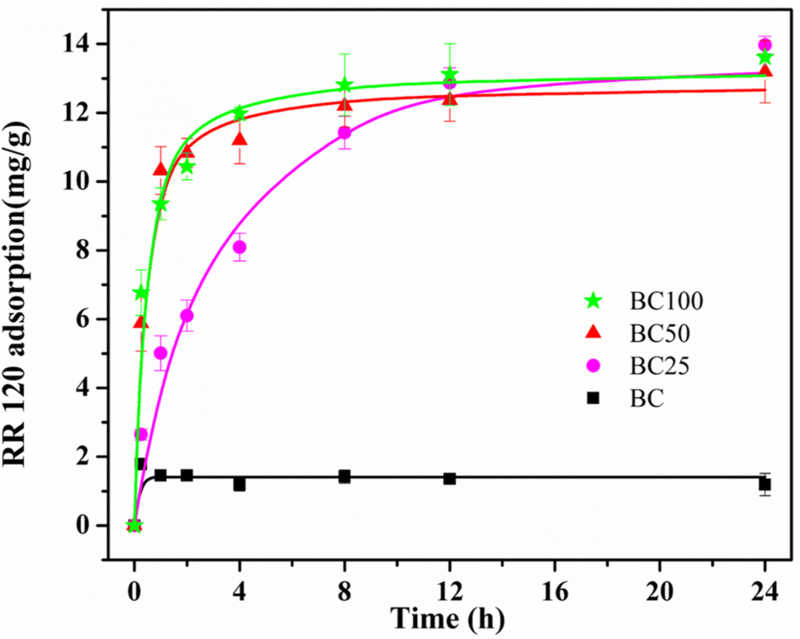 In this work, BC/g-C3N4 composites were successfully synthesized through one-pot pyrolysis of biomass and urea at different ratios. The resultant composites showed both adsorptive ability and photocatalytic activities to RR120 in aqueous solutions. The BC100 sample with the highest g-C3N4 content was the best with the highest RR120 removal through both adsorption and photocatalytic degradation. Findings of this study demonstrate that g-C3N4 modification can expand biochar’s capacity as an unlimited adsorbent to remove aqueous RR120 through adsorption and photodegradation. The BC/g-C3N4 composites developed in this study are a promising and affordable remediation agent to be applied for sustainable and efficient removal of organic contaminates in the environment under natural conditions. This work was partially supported by the USDA through Grant 2018-38821-27751.